Research and Evaluation Methodology thesis, Ph.D. The mediated effect is generally nonnormally distributed. Therefore, nonnormal data could cause more serious bias in estimating and testing the mediated effect. This study aimed to investigate the impact of nonnormality on estimating and testing the mediated effect in longitudinal mediation analysis using a parallel process latent growth curve model. In this Monte Carlo simulation study, the design factors were the degree of nonnormality, effect size of the mediated effect, sample size, and the R^2 value of the observed variables The dependent variables were the relative bias of the mediated effect and of the standard error estimates, empirical Type I error and power rates. In this study, accurate estimates of the mediated effect and standard error and the adequate statistical power were found when the effect size of the mediated effect, R^2, and sample size were larger. Also, it was found that nonnormality had little effect on the accuracy of the estimates of the mediated effect and standard error, empirical Type I error, and power rates except in a few conditions. Furthermore, this study found that relatively small sample sizes (e.g., 100 and 200) frequently caused outliers of the mediated effect and standard error estimates, and also standard error estimates were more frequently and inconsistently biased when both paths (a and b) were zero. In terms of empirical Type I error and power rates, the bias-corrected bootstrap performed best and then, the asymmetric distribution and Sobel’s methods followed. Also, it was found that Sobel’s method produced very conservative Type I error rates when the estimated mediated effect and standard error had a relationship, but when the relationship was weak or did not exist the Type I error was closer to the nominal 0.05 value. Thesis (Ph.D.)--University of Florida, 2012. 13 measurement errors and conducting overall model fit test (e.g., chi squared test). Recently, new mediation models have been developed within structural equation and multilevel modeling frameworks such as mediation models combined with par allel process latent growth models (Cheong et al., 2003; Cheong, 2011; von Soest & Hagtvet, 2011), multilevel models (Bauer, Preacher, & Gil, 2006; Krull & MacKinnon, 1999; 2001, Pituch et al., 2006; Pituch & Stapleton, 2008), and multilevel structural equ ation models (Preacher et al., 2010; Preacher, 2011). Mediation models such as a single level mediation model and a multilevel mediation model (Krull & MacKinnon, 1999; 2001) and a multilevel mediation model and a multilevel structural equation mediation m odel (Li, 2011) have been compared under varied conditions through Monte Carlo simulations. Because the mediated effect (i.e., usually, the product of two regression coefficients) does not always follow a normal distribution, conventional normal theory te sts (i.e., and test) are not correct for testing the mediated effect. Thus, various new statistical methods such as resampling methods using different types of bootstrapping or j ackknife and methods based on the (asymmetric) distribution of products have been d eveloped and compared (MacKinnon et al., 2002; MacKinnon et al., 2004; MacKinnon et al., 2007; Pituch et al., 2006; Pituch & Stapleton, 2008; Sobel, 1982). Pituch et al. (2006) and Pituch and Stapleton (2008) examined several methods for testing the mediat ed effect with multilevel models, and fou nd that a resampling method (e.g ., bias corrected bootstrap ) and the asymmetric distribution method (i.e., the test based on the asymmetric distribution of the product ) consistently performed best under normality an d nonnormality. 17 substantial nonnormality), mediated effect sizes (i.e zero, small, medium, and large mediated eff ect sizes), values of measured variables (i.e., 0.5 and 0.8), and sample sizes (i.e., 100, 200, 500, and 1000). The dependent variables were the relative bias of parameter estimates, relative bias of standard error estimates, and Type I error and statistical pow er rates. 27 (usually, ) and compute the mean and variance of a parameter estimate and then, construct confidence intervals with the estimates from bootstrap samples. Bollen and Stine (1990) introduced bootstrap methods in mediation analysis with regre ssion models, and compared parameter estimates, standard errors, and confidence intervals between the classical (e.g., test and and bootstrap methods. Shrout and Bolger (2002) recommended bootstrap methods in mediation analy sis when we have small to moderate sample sizes ( MacKinnon et al. (2004) conducted extensive simulation study with regression models to compare different methods for estimating and testing the mediated effect including different resampling methods such as bootstrap (e.g., percentile bootstrap, bias corrected bootstrap, bootstrap t, and bootstrap Q), jackknife, and Monte Carlo. Pituch et al. (2006) and Pituch and Stapleton (2008) compared more bootstrap methods (e.g., parametric percentile bootstrap bias corrected parametric percentile bootstrap, nonparametric percentile bootstrap, bias corrected nonparametric percentile bootstrap, stratified nonparametric percentile bootstrap, bias corrected stratified nonparametric percentile bootstrap) in their s imulations in multilevel mediation analysis. Previous simulation studies (MacKinnon et al., 2004; Pituch et al., 2006; Pituch & Stapleton, 2008) found that the bias corrected bootstrap method performed best among the bootstrap methods. However, in Monte Carlo Simulation studies, bootstrap methods are sometimes time consuming because of the extensive computations when statistical models and/or simulation conditions are complex (MacKinnon et al., 2004; Pituch et al., 2006; Pituch & Stapleton, 2008). Moreove r, software availability is important to use bootstrap methods. 32 percentile and bias correct percentile method. The coverage error of this method is smaller than the percentile and bias corrected percentile methods; however, the coverage error increases as (Carpenter & Bithell, 2000). The complicat ion in using this method is estimating the constant It can be estimated by using the jackknife, but this would require an additional estimations of the model, where is the sample size, for each replication of the simulation. Therefore, the accel erated bias corrected percentile method was not investigated in this dissertation. Latent Growth Modeling Latent growth models in structural equation modeling have been popularly used in longitudinal data analysis (Ferrer, Hamagami, & McArdle, 2004; Flora 2008; Leite, 2007; Leite & Stapleton, 2011). According to Bollen and Curran (2006), current latent growth models were first proposed by Meredith and Tisak (1984; 1990), which were based on the previous growth models and exploratory factor analytic models (e.g., Rao, 1958; Tucker, 1958; 1966). Meredith and Tisak (1990) pointed out that standard repeated measures ANOVA or MANOVA models are the special cases of their growth model (i.e., latent growth model) and also their approach can simultaneously model an d test both individual differences and different types of growth trends, which is the main advantage over traditional growth models. Researchers have presented different types of latent growth modeling such as multivariate latent growth models (e.g., McArd le, 1988; Leite, 2007), multilevel latent growth models (e.g., Muthn, 1997), growth mixture models (e.g., Muthn & Shedden, 1999; Bauer & Curran, 2003), latent growth models for mediation analysis (Cheong et al., 2003; Cheong, 2011; von Soest & Hagtvet, 2 011) and so on. 37 errors using order solution (i.e., Equation 2 4) and calculated empirical power rates using three methods: Sobel s first order solution (i.e., Equations 2 4 and 2 5 ) the asymmetric distribution confidence interval (i.e., Equation s 2 4 2 11 and 2 12 ) and the joint significant test (i.e., two tests: and ). The following are Cheong s findings: The accuracy of the mediated effect and standard error estimates increased as the sample size, and number of measurement occasions increased. However, the increase in effect size of the mediated effect did not improve the accuracy of the estimates in many conditions. Empirical power rates increased as all the design factors increased. The asymmet ric distribution confidence interval and the joint significant test produced equivalent empirical power rates t hat were higher than those from Sobel s first order solution. Significance of This Study In longitudinal mediation analysis, a parallel process l atent growth model can be useful to test the longitudinal mediated effect. Previous longitudinal research has used a parallel process latent growth model to investigate whether the growth rate of the mediator mediated the relationship between the independe nt variable (e.g., intervention) and the growth rate of the dependent variable (e.g., Cheong et al., 2003; Jagers et al., 2007; Littlefield et al. 2010; von Soest & Wichstrm, 2009). Perhaps these studies assumed normal data, which is rarely met in practi ce. Furthermore, the distribution or test of the mediated effect has been one of the main issues in mediation analysis; however, there is not much information about the effects of nonnormality. Thus, it would be informative to investigate the effects of no nnormality using a parallel process latent growth model. 38 Research Questions This study aims to assess the effects of nonnormality on estimating and testing the mediated effect using a parallel process latent growth model. The research questions of this stu dy are: 1. What are the effects of nonnormality (depende nt variable or mediator) on the parameter estimates and standard error estimates of (mediated effect)? 2. What are the effects of nonnormality on the statistical power and Type I error rates for the test of ? 3. Among corrected bootstrap, which procedures provide adequate Type I error rates for the test of ? 4. Among nd the bias corrected bootstrap, which p rocedures provide the best powe r for the test of ? 46 the range of kurtosis is [0, 3.9]). In a multilevel modeling framework, Pituch and Stapleton (2008) compared various statistical te sts (e.g., the asymmetric distribution method and bootstrap methods) for the multilevel mediated effect under various degrees of nonnormality: The authors generated errors in the level one and two equations with normal and chi squared distributions with 1 and 2 degree of freedoms. The chi squared distribution with 1 degree of freedom modeled severe nonnormality (i.e., the skewness and kurtosis are 2.828427 and 12 respectively) and the chi squared distribution with 2 degrees of freedom modeled moderate nonno rmality (i.e., the skewness and kurtosis are 2 and 6 respectively). In the measurement model in Lei and Lomax (2005), each latent variable was measured by three observed variables, and in the structural model two latent variables were a function (linear c ombination) of other latent variables. Also, in Pituch and Stapleton (2008), some variables in the level one equation were linear combination of other variables in level one and level two equations. Therefore, in these simulation studies, the skewness and kurtosis of the combined variables could be changed by the coefficients or variances of the other variables. Thus, it would be informative to provide the population skewness and kurtosis values of all the variables to see the degree of nonnormality in the data. Skewness and kurtosis of all latent and observed variables are provided in the following section. In this study, based on Pituch and Stapleton (2008), nonnormal distribution were generated using chi squared distributions with 1 and 2 degree of freedo ms; Table 3 2 summarizes how the distributions were generated with normal and chi squared distributions. 49 where is the sample size. With a very large sample size such as we can estimate the population skewness and kurtosis (Muthn & Asparouhov, 2002). In this study, using the Equations 3 6 and 3 7, aver age skewness and kurtosis values were estimated with and 100 replications using R program. Then, the relative biases in Equation 3 2 were computed with the population values in Table 3 2. As expected, the relative biases were almost zero. Ther efore, the data generation by R program was correct. 51 Table 3 2. The generation of the degree of nonnormality Normality Moderately Nonnormality Substantially Nonnormality (i.e., in Equations 2 3 1 to 2 34 is generated to follow a Bernoulli distribution with p = 0.5). her variables are generated to follow normal distributions: 1) Errors in measurement equations (i.e., in Equation 2 24 and in Equation 2 25 ). 2) Errors in structural equations ( in Equation 2 3 1 in Equation 2 3 2 in Equation 2 3 3 in Equation 2 34 ). dependent variable are the linear combination of the above variables. (i.e., in Equations 2 3 1 to 2 34 is generated to follow a Berno ulli distribution with p = 0.5). generated to follow chi squared distribution with df = 2, and then transformed to have the mean of zero and specific variance at each time point: 1) Errors in measurement equations (i.e., in Equation 2 24 and in Equation 2 25 ). 2) Errors in structural equations ( in Equation 2 3 1 in Equation 2 3 2 in Equation 2 3 3 in Equation 2 34 ). dependent variable are t he linear combination of the above variables. (i.e., in Equations 2 3 1 to 2 34 is generated to follow a Bernoulli distribution with p = 0.5). generated to follow chi squared distribution with df=1, an d then transformed to have the mean of zero and specific variance at each time point: 1) Errors in measurement equations (i.e., in Equation 2 24 and in Equation 2 25 ). 2) Errors in structural equations ( in Equation 2 3 1 in Equation 2 3 2 in Equation 2 3 3 in Equation 2 34 ). dependent variable are the linear combination of the above variables. Table 3 3. Cumulants of Normal, Bernoulli, and Chi square distribut ions Normal distribution Bernoulli distribution Chi squared distribution where, in this study. where, df = 1 (substantially nonnormal) and df = 2 (moderately nonnormal) in this study. 52 Table 3 4. Population skewness, and kurtosis values of latent and observed variables S ubstantial nonnormality (Chi Squared with 1 degree of freedom) Moderate nonnormality (Chi Squared with 2 degree of freedom) Mediated effect size Small Medium Large No Small Medium Large No Intercepts of mediator and DV Skewness 2.828 2.828 2.828 2.828 2 2 2 2 Kurtosis 12 12 12 12 6 6 6 6 Slo pe of mediator Skewness 2.27 4 1.88 1 1.23 3 2.529 1.60 8 1.3 30 0.87 2 1.788 Kurtosis 8.680 6.683 3.55 3 10.02 5 4.335 3.309 1.631 5.008 Slope of DV 2) Skewness 1.92 6 1.56 9 1.151 1.810 1.36 3 1.10 9 0.81 5 1.28 2 Kurtosis 6.880 4.999 2.99 3 6.027 3.427 2.45 8 1.3 97 3.01 7 Mediator at time 1 Skewness 2.27 7 2.27 7 2.27 7 2.27 7 1.61 1.61 1.61 1.61 Kurtosis 8.16 8.16 8.16 8.16 4.08 4.08 4.08 4.08 Mediator at time 2 Skewness 2.024 1.990 1.901 2.042 1.431 1.407 1.344 1.444 Kurtosis 6.713 6.56 2 6.170 6.792 3.35 7 3.28 1 3.083 3.396 Mediator at time 3 Skewness 1.68 8 1.603 1.404 1.73 4 1.193 1.13 4 0.99 3 1.226 Kurtosis 4.639 4.326 3.595 4.809 2.319 2.16 1 1.780 2.40 5 Mediator at time 4 Skewness 1.54 5 1.42 3 1.159 1.613 1.092 1.00 6 0.8 20 1.141 Kurtosis 3.806 3.398 2.518 4 .036 1.902 1.69 3 1.2 20 2.018 Mediator at time 5 Skewness 1.534 1.382 1.073 1.622 1.08 5 0.977 0.7 60 1.147 Kurtosis 3.836 3.320 2.268 4.136 1.91 7 1.6 50 1.076 2.068 DV at time 1 Skewness 2.27 7 2.27 7 2.27 7 2.27 7 1.61 1.61 1.61 1.61 Kurtosis 8.16 8.16 8. 16 8.16 4.08 4.08 4.08 4.08 DV at time 2 Skewness 2.007 1.98 1 1.91 3 2.01 1 1.420 1.399 1.35 4 1.42 2 Kurtosis 6.66 3 6.574 6.27 4 6.70 7 3.335 3.27 6 3.146 3.353 DV at time 3 Skewness 1.637 1.570 1.433 1.64 2 1.158 1.109 1.01 4 1.16 1 Kurtosis 4.505 4.29 3 3.780 4.561 2.252 2.13 4 1.879 2.280 DV at time 4 Skewness 1.45 6 1.35 5 1.18 1 1.450 1.030 0.957 0.835 1.025 Kurtosis 3.529 3.197 2.59 8 3.50 8 1.76 5 1.58 5 1.27 6 1.754 DV at time 5 Skewness 1.407 1.27 3 1.074 1.384 0.99 6 0. 900 0.7 60 0.97 9 Kurtosis 3.38 1 2.880 2.192 3.225 1.68 6 1.428 1.0 60 1.612 Note: 1) DV is the dependent variable. 2) for the s mall mediated effect size ; for the medium mediated effect size; for large mediated effect; for no mediated effect. 3 ) indicates the estimate of skewnesss and kurtosis from 1,000,000 sam ple size and 100 Replications because independence assumption is not met (i.e., ). 58 standard error when there is no mediated effect (i.e., ). Moreover, departures from normality did not cause more bias. Result s when Tables 4 7 to 4 9 show the results under different values of path (= 0.16, 0.35, and 0.49) when path was zero. In Tables 4 7 to 4 9, the median and mean mediated effects were almost zero across all conditions; however, standard error es timates were biased (median relative bias > 0.1) with relatively small sample sizes of 100 and 200 when was 0.5. Because the results in Tables 4 7 to 4 9 are similar, we can conclude that there is little effect of different values of in estimatin g the mediated effect and standard error. The exception to this generalization was for the estimated standard errors when was .50 and the sample size was 100 or 200. In these conditions the median bias tended to decrease as increased. Furthermor e, there was no impact of nonnormality on estimating the mediated effect and standard error when path was zero. Results when Table 4 10 shows the results when both paths and were zero. Median and mean mediated effect estimates were zero in all conditions, which indicates that all the bias es for the mediated effect estimates were acceptable However, standard error estimates were biased more frequently and inconsistently than the previous results when only one path was zero. Also, median a nd mean relative biases of standard error estimates were very different ( ) indicating outlying standard error estimates in many conditions. Therefore, when both paths and were zero, standard error estimates were not stably estimated although the mediated effects were correctly estimated. 64 size was 1,000 and when was 0.8 the sample size was 500 or more. Nonnormality did not affect empirical power rates for any condition. To have 0.8 power with a medium effect size, the sample size should be 200 when is 0.8 and 500 when is 0.5. Figure 4 9 displays power curves observed in Table 4 19. Large Effect Size of the Mediated Effect Table 4 20 shows empirical power rates when the mediated effect size was large. When was 0.8, the power was greater than 0.8 across all conditions. However, when was 0.5, powe r rates were greater than 0.8 in the conditions in which the sample size was 500 or above. The bias corrected bootstrap resulted in much greater power than other methods when was 0.5 and the sample size was 200 or smaller. For the bias corrected boo tstrap, the sample size of 200 was needed to have almost 0.80 power with the low value of 0.5. Departures from normality produced similar power rates, and therefore based on the results in Tables 4 19 and 4 20, we can conclude that nonnormality did not affect empirical power rates. 65 Table 4 1. Median and mean relative biases of the mediated effect estimates ( ) and standard error estimates ( ) for a small mediated effect size Path Path Sample Size Degree of Nonnor mality of Median (Mean) Relative Bias for Median (Mean) Relative Bias for 0.18 0.16 0.5 100 Normal 0.352 ( 0.327) 0.529 (0.522) Moderate 0.399 ( 0.385) 0.527 (0.706) Subst antial 0.363 ( 0.270) 0.547 (0.965) 200 Normal 0.235 ( 0.185) 0.337 (0.040) Moderate 0.234 ( 0.191) 0.468 (0.087) Substantial 0.193 ( 0.167) 0.392 (0.121) 500 Normal 0.091 ( 0.044) 0.065 ( 0.009) Moderate 0.112 ( 0.064) 0.095 ( 0.024) Substantial 0.086 ( 0.053) 0.109 ( 0.033) 1000 Normal 0.044 ( 0.013) 0.025 (0.000) Moderate 0.043 ( 0.016) 0.029 ( 0.007) Substantial 0.042 ( 0.019) 0.030 (0.001) 0.8 100 Normal 0.157 ( 0.023) 0.080 ( 0.046) Moderate 0.185 ( 0.043) 0.095 ( 0.037) Substantial 0.211 ( 0.058) 0.208 ( 0.099) 200 Normal 0.076 ( 0.024) 0.018 ( 0.005) Moderate 0.089 ( 0.019) 0.076 ( 0.043) Substantial 0.097 ( 0.021) 0.120 ( 0. 068) 500 Normal 0.034 ( 0.007) 0.002 (0.004) Moderate 0.033 (0.002) 0.032 ( 0.019) Substantial 0.046 ( 0.009) 0.056 ( 0.031) 1000 Normal 0.017 ( 0.007) 0.005 (0.008) Moderate 0.018 ( 0.003) 0.017 ( 0.009) Substantial 0 .018 ( 0.003) 0.031 ( 0.013) Note: 1) A mediated effect size is small 2) Standard errors were (1982) first o rder Solution. 4) Relative biases with are not acceptable (for and for ). 66 Table 4 2. Median and mean relative biases of the mediated effect estimates ( ) and standard error estimates ( ) for a medium mediated effect size Path Path Sample Size Degree of Nonnormality of Median (Mean) Relativ e Bias for Median (Mean) Relative Bias for 0.31 0.35 0.5 100 Normal 0.109 (0.012) 0.524 (0.688) Moderate 0.124 (0.006) 0.526 (0.572) Substantial 0.140 ( 0.052) 0.538 (0 .751) 200 Normal 0.004 (0.004) 0.363 (0.107) Moderate 0.004 (0.003) 0.394 (0.059) Substantial 0.005 (0.002) 0.428 (0.330) 500 Normal 0.018 (0.004) 0.077 ( 0.017) Moderate 0.032 ( 0.001) 0.106 ( 0.026) Subs tantial 0.019 (0.003) 0.108 ( 0.026) 1000 Normal 0.013 ( 0.001) 0.023 ( 0.002) Moderate 0.011 (0.002) 0.051 ( 0.025) Substantial 0.011 (0.001) 0.046 ( 0.010) 0.8 100 Normal 0.053 ( 0.006) 0.069 ( 0.039) Mod erate 0.051 (0.006) 0.158 ( 0.081) Substantial 0.059 (0.001) 0.166 ( 0.074) 200 Normal 0.030 (0.000) 0.033 ( 0.021) Moderate 0.009 (0.009) 0.049 ( 0.023) Substantial 0.027 (0.000) 0.094 ( 0.049) 500 Normal 0. 008 (0.000) 0.017 ( 0.014) Moderate 0.010 (0.000) 0.040 ( 0.029) Substantial 0.015 (0.000) 0.049 ( 0.024) 1000 Normal 0.008 ( 0.004) 0.008 ( 0.005) Moderate 0.006 ( 0.001) 0.002 (0.013) Substantial 0.003 (0.004) 0.033 ( 0.020) Note: 1) A mediated effect size is medium 2) Standard errors we re order s olution based on robust standard er rors. 4) Relative biases with are not acceptable (for and for ). 67 Table 4 3. Median and mean relative biases of the mediated effect estimates ( )and standard error estimates ( ) for a large mediated effect size Path Path Sample Size Degree of Nonnormality of Me dian (Mean) Relative Bias for Median (Mean) Relative Bias for 0.52 0.49 0.5 100 Normal 0.018 (0.110) 0.527 (0.521) Moderate 0.038 (0.091) 0.544 (0.665) Substantial 0.025 (0.0 73) 0.547 (0.751) 200 Normal 0.011 (0.099) 0.431 (0.088) Moderate 0.002 (0.067) 0.432 (0.157) Substantial 0.008 (0.069) 0.450 (0.124) 500 Normal 0.000 (0.022) 0.081 ( 0.011) Moderate 0.007 (0.018) 0.086 ( 0.01 0) Substantial 0.000 (0.028) 0.220 ( 0.102) 1000 Normal 0.007 (0.014) 0.035 ( 0.005) Moderate 0.002 (0.009) 0.041 ( 0.008) Substantial 0.001 (0.011) 0.066 ( 0.026) 0.8 100 Normal 0.016 (0.011) 0.103 ( 0.065) Moderate 0.023 (0.012) 0.154 ( 0.083) Substantial 0.024 (0.016) 0.211 ( 0.091) 200 Normal 0.000 (0.009) 0.051 ( 0.032) Moderate 0.001 (0.013) 0.077 ( 0.046) Substantial 0.017 (0.000) 0.110 ( 0.056) 500 Normal 0.004 (0.003) 0.027 ( 0.020) Moderate 0.002 (0.004) 0.039 ( 0.024) Substantial 0.009 (0.000) 0.039 ( 0.016) 1000 Normal 0.003 (0.001) 0.020 ( 0.018) Moderate 0.001 (0.003) 0.028 ( 0.018) Substantial 0.001 (0.00 2) 0.035 ( 0.020) Note: 1) A mediated effect size is large. 2) Standard errors we (1982) first order s olution based on robust standard errors. 4) Relative biases with are not acceptable (for and for ). 68 Table 4 4. Median and mean mediated effect estimates ( ) and median and mean relative biases for the standard error estimates ( ) for no mediated effect across when Path Path Sample Size Degree of Nonnormality o f Median (Mean) for Median (Mean) Relative Bias for 0.18 0 0.5 100 Normal 0.002 ( 0.024) 0.586 (0.479) Moderate 0.001 ( 0.018) 0.607 (0.455) Substantial 0.001 ( 0.020) 0. 603 (0.602) 200 Normal 0.003 ( 0.012) 0.440 ( 0.003) Moderate 0.002 ( 0.013) 0.484 (0.027) Substantial 0.002 ( 0.012) 0.532 (0.159) 500 Normal 0.001 ( 0.003) 0.099 ( 0.020) Moderate 0.001 ( 0.003) 0.101 ( 0.018) Substantial 0.001 ( 0.003) 0.142 ( 0.039) 1000 Normal 0.000 ( 0.001) 0.037 ( 0.007) Moderate 0.001 ( 0.002) 0.027 (0.012) Substantial 0.000 ( 0.001) 0.069 ( 0.023) 0.8 100 Normal 0.001 ( 0.002) 0.091 ( 0.036) Moderate 0.001 ( 0.002) 0.191 ( 0.098) Substantial 0.001 ( 0.002) 0.261 ( 0.143) 200 Normal 0.000 ( 0.001) 0.043 ( 0.024) Moderate 0.001 ( 0.001) 0.063 ( 0.025) Substantial 0.001 ( 0.001) 0.112 ( 0.059) 500 Normal 0.000 ( 0.001) 0.027 ( 0.020) Moderate 0.000 ( 0.001) 0.044 ( 0.024) Substantial 0.000 (0.000) 0.051 ( 0.024) 1000 Normal 0.000 (0.000) 0.017 ( 0.013) Moderate 0.000 (0.000) 0.014 ( 0.005) Substantial 0.000 (0.000) 0.022 ( 0.009) Note: 1) A mediated effect size is zero 2) Standard errors we re order s olution based on robust standard errors. 4) Relative biases with are not acceptable (for and for ). 69 Table 4 5. Median and mean mediated effect estimates ( ) and median and mean relative biases for the standard error estimates ( ) for no med iated effect when Path Path Sample Size Degree of Nonnormali ty of Median (Mean) for Median (Mean) Relative Bias for 0.31 0 0.5 100 Normal 0.004 ( 0.032) 0.563 (0.480) Moderate 0.006 ( 0.037) 0.564 (0.590) Substantial 0.004 ( 0.037) 0.573 (0.748) 200 Normal 0.004 ( 0.018) 0.457 (0.009) Moderate 0.005 ( 0.022) 0.495 (0.077) Substantial 0.003 ( 0.020) 0.504 (0.062) 500 Normal 0.002 ( 0.005) 0.097 ( 0.009) Moderate 0.002 ( 0.005) 0.106 ( 0.017 ) Substantial 0.002 ( 0.006) 0.167 ( 0.054) 1000 Normal 0.001 ( 0.002) 0.030 (0.005) Moderate 0.001 ( 0.002) 0.032 (0.005) Substantial 0.001 ( 0.002) 0.082 ( 0.038) 0.8 100 Normal 0.003 ( 0.005) 0.113 ( 0.069) Moderate 0.003 ( 0.004) 0.165 ( 0.089) Substantial 0.002 ( 0.003) 0.259 ( 0.128) 200 Normal 0.001 ( 0.002) 0.045 ( 0.027) Moderate 0.001 ( 0.002) 0.097 ( 0.060) Substantial 0.001 ( 0.001) 0.113 ( 0.060) 500 Nor mal 0.000 ( 0.001) 0.022 ( 0.014) Moderate 0.001 ( 0.001) 0.040 ( 0.025) Substantial 0.001 ( 0.001) 0.053 ( 0.025 1000 Normal 0.001 ( 0.001) 0.020 ( 0.015) Moderate 0.000 (0.000) 0.028 ( 0.019) Substantial 0.001 ( 0 .000) 0.011 (0.002) Note: 1) A mediated effect size is zero 2) Standard errors we re order s olution based on robust standa rd errors. 4) Relative biases with are not acceptable (for and f or ). 70 Table 4 6. Median and mean mediated effect estimates ( ) and median and mean relative biases for the standard error estimates ( ) for no mediated effect when Path Path Sample Size Degree of Nonno rmality of Median (Mean) for Median (Mean) Relative Bias for 0.52 0 0.5 100 Normal 0.013 ( 0.063) 0.560 (0.517) Moderate 0.012 ( 0.059) 0.560 (0.585) Substantial 0.006 ( 0.051) 0.586 (0.683) 200 Normal 0.008 ( 0.031) 0.458 (0.019) Moderate 0.011 ( 0.038) 0.511 (0.027) Substantial 0.008 ( 0.033) 0.506 (0.119) 500 Normal 0.005 ( 0.010) 0.102 ( 0.024) Moderate 0.005 ( 0.011) 0.156 ( 0.057) Substantial 0.001 ( 0.007) 0.153 ( 0.034) 1000 Normal 0.001 ( 0.004) 0.037 ( 0.004) Moderate 0.001 ( 0.004) 0.059 ( 0.018) Substantial 0.003 ( 0.005) 0.067 ( 0.023) 0.8 100 Normal 0.004 ( 0.008) 0.141 ( 0.085) Moderate 0.004 ( 0.005) 0.190 ( 0.110) Substantial 0.005 ( 0.008) 0.245 ( 0.139) 200 Normal 0.003 ( 0.004) 0.053 ( 0.035) Moderate 0.004 ( 0.003) 0.074 ( 0.041) Substantial 0.003 ( 0.003) 0.115 ( 0.062) 500 Normal 0.000 (0.000) 0.010 ( 0.004) Moderate 0.001 (0.000) 0.035 ( 0.018) Substantial 0.001 ( 0.001) 0.062 ( 0.036) 1000 Normal 0.001 ( 0.001) 0.013 ( 0.010) Moderate 0.000 (0.000) 0.011 ( 0.004) Substantial 0. 001 ( 0.001) 0.054 ( 0.037) Note: 1) A mediated effect size is zero 2) Standard errors we re order s olution based on robust standard errors. 4) Relative biases with are not acceptable (for and for ). 71 Table 4 7. Median and mean mediated effect estimates ( ) and median and mean relative biases for the standard error estimates ( ) for no mediated effect when Path Path Sample Size Degree o f Nonnormality of Median (Mean) for Median (Mean) Relative Bias for 0 0.16 0.5 100 Normal 0.000 (0.001) 0.507 (0.434) Moderate 0.000 ( 0.001) 0.503 (0.328) Substantial 0.000 ( 0.001) 0.527 (0.615) 200 Normal 0.000 (0.000) 0.235 (0.221) Moderate 0.000 (0.000) 0.203 (0.249) Substantial 0.000 (0.000) 0.290 (0.247) 500 Normal 0.000 (0.000) 0.053 (0.106) Moderate 0.000 (0.000) 0.034 (0.090) Substantial 0.000 (0.000) 0.008 (0.051) 1000 Normal 0.000 (0.000) 0.009 (0.025) Moderate 0.000 (0.000) 0.010 (0.030) Substantial 0.000 (0.000) 0.005 (0.028) 0.8 100 Normal 0.000 (0.000) 0.009 (0.065) Moderate 0.000 (0.00 0) 0.036 (0.041) Substantial 0.000 (0.000) 0.091 (0.032) 200 Normal 0.000 (0.000) 0.006 (0.023) Moderate 0.000 (0.000) 0.015 (0.015) Substantial 0.000 (0.000) 0.030 (0.014) 500 Normal 0.000 (0.000) 0.003 (0.003) Mode rate 0.000 (0.000) 0.001 (0.008) Substantial 0.000 (0.000) 0.005 (0.015) 1000 Normal 0.000 (0.000) 0.006 ( 0.007) Moderate 0.000 (0.000) 0.007 (0.009) Substantial 0.000 (0.000) 0.008 (0.007) Note: 1) A mediated effect size is zero 2) Standard errors we re order s olution based on robust standa rd errors. 4) Relative biases with are not acceptable (for and for ). 72 Table 4 8. Median and mean m ediated effect estimates ( ) and median and mean relative biases for the standard error estimates ( ) for no mediated effect when Path Path Sample Size Degree of Nonnormality of Median (Mean) for Median (Mean) Relative Bias for 0 0.35 0.5 100 Normal 0.000 ( 0.003) 0.391 (0.471) Moderate 0.000 ( 0.002) 0.407 (0.545) Substantial 0.000 (0.000) 0.428 (0.522) 200 Normal 0.000 (0.001) 0.169 (0.049) Moderate 0.000 (0.000) 0.171 (0.429) Substantial 0.000 (0.000) 0.161 (0.164) 500 Normal 0.000 (0.000) 0.014 ( 0.003) Moderate 0.000 (0.000) 0.016 (0.036) Substantial 0.000 (0.000) 0.037 ( 0.016) 1000 Normal 0.000 (0.000) 0.022 ( 0.019) Moderate 0.000 (0.000) 0.019 ( 0.017) Substantial 0.000 (0.000) 0.009 (0.013) 0.8 100 Normal 0.000 (0.000) 0.041 ( 0.034) Moderate 0.000 (0.000) 0.042 ( 0.017) Substantial 0.000 (0.000) 0 .058 ( 0.023) 200 Normal 0.000 (0.000) 0.012 ( 0.010) Moderate 0.000 (0.000) 0.011 ( 0.012) Substantial 0.000 (0.000) 0.019 ( 0.010) 500 Normal 0.000 (0.000) 0.017 (0.016) Moderate 0.000 (0.000) 0.015 ( 0.014) Subst antial 0.000 (0.000) 0.006 ( 0.003) 1000 Normal 0.000 (0.000) 0.022 ( 0.023) Moderate 0.000 (0.000) 0.008 ( 0.012) Substantial 0.000 (0.000) 0.015 ( 0.015) Note: 1) A mediated effect size is zero 2) Standard error s we re order s olution based on robust standard errors. 4) Relative biases with are not acceptable (for and for ). 73 Table 4 9. Median and mean mediated effect estimates ( ) and me dian and mean relative biases for the standard error estimates ( ) for no mediated effect when Path Path Sample Size Degree of Nonnormality of Median (Mean) for Median (Mean) Relative Bias for 0 0.49 0.5 100 Normal 0.000 ( 0.001) 0.332 (0.440) Moderate 0.000 (0.002) 0.351 (0.442) Substantial 0.000 (0.000) 0.357 (0.506) 200 Normal 0.001 (0.000) 0.115 (0.072) Moderate 0.000 (0.000) 0.163 (0.137) Substantial 0.000 ( 0.001) 0.182 (0.194) 500 Normal 0.001 (0.000) 0.010 (0.006) Moderate 0.000 ( 0.001) 0.026 ( 0.005) Substantial 0.000 (0.000) 0.015 (0.008) 1000 Normal 0.000 (0.000) 0.017 ( 0.013) Moderate 0.000 (0.000) 0.012 ( 0.008) Substantial 0.000 (0.000) 0.002 (0.004) 0.8 100 Normal 0.001 ( 0.001) 0.029 ( 0.021) Moderate 0.000 (0.000) 0.039 ( 0.029) Substantial 0.000 (0.001) 0.046 ( 0.028) 200 Normal 0 .000 (0.000) 0.024 ( 0.024) Moderate 0.000 (0.000) 0.034 ( 0.028) Substantial 0.000 (0.001) 0.040 ( 0.034) 500 Normal 0.000 (0.000) 0.002 (0.004) Moderate 0.000 (0.000) 0.017 ( 0.017) Substantial 0.000 (0.000) 0.009 ( 0.01 0) 1000 Normal 0.000 (0.000) 0.008 ( 0.008) Moderate 0.000 (0.000) 0.014 (0.016) Substantial 0.000 (0.000) 0.003 (0.005) Note: 1) A mediated effect size is zero 2) Standard errors we re t order s olution based on robust standa rd errors. 4) Relative biases with are not acceptable (for and for ). 74 Table 4 10. Median and mean mediated effect estimates ( ) and median and mean relative biases for the standard error estimates ( ) for no mediated effect when Path Path Sample Size Degree of Nonnormality of Median (Mean) for Median (Mean) Relative Bias for 0 0 0.5 10 0 Normal 0.000 ( 0.001) 0.473 (0.371) Moderate 0.000 ( 0.001) 0.506 (0.726) Substantial 0.000 ( 0.001) 0.509 (0.516) 200 Normal 0.000 (0.000) 0.371 (0.195) Moderate 0.000 (0.001) 0.455 (0.180) Substantial 0.000 (0.0 00) 0.528 (0.236) 500 Normal 0.000 (0.000) 0.012 (0.133) Moderate 0.000 (0.000) 0.014 (0.146) Substantial 0.000 (0.000) 0.023 (0.133) 1000 Normal 0.000 (0.000) 0.119 (0.225) Moderate 0.000 (0.000) 0.136 (0.246) Subs tantial 0.000 (0.000) 0.071 (0.196) 0.8 100 Normal 0.000 (0.000) 0.062 (0.169) Moderate 0.000 (0.000) 0.049 (0.174) Substantial 0.000 (0.000) 0.090 (0.068) 200 Normal 0.000 (0.000) 0.116 (0.207) Moderate 0.000 (0.000) 0.1 17 (0.204) Substantial 0.000 (0.000) 0.093 (0.192) 500 Normal 0.000 (0.000) 0.163 (0.237) Moderate 0.000 (0.000) 0.133 (0.214) Substantial 0.000 (0.000) 0.096 (0.197) 1000 Normal 0.000 (0.000) 0.165 (0.245) Moderate 0. 000 (0.000) 0.163 (0.260) Substantial 0.000 (0.000) 0.164 (0.241) Note: 1) A mediated effect size is zero 2) Standard errors we re estimated order s olution based on robust standa rd errors. 4) Relative biases with are not acceptable (for and for ). 75 Table 4 order solution, the asymmetric distribution, and bias corrected bootstrap methods: and Path Path Sample Size Degree of Nonnormality of First Order Solution Asymmetric Distribution Bias Corrected Bootstrap 0.18 0 0.5 100 Normal 0 0.001 0.031 Moderate 0.001 0.003 0.033 Substantial 0 0.001 0.041 200 Normal 0.003 0.014 0.053 Moderate 0.002 0.011 0.059 Substantial 0.001 0.01 0.062 500 Normal 0.023 0.04 0.077 Moderate 0.017 0.036 0.068 Substantial 0.011 0.038 0.078 1000 Normal 0.035 0.046 0.067 Moderate 0.029 0.046 0.055 Substantial 0.024 0.037 0.061 0.8 100 Normal 0.004 0.02 0.047 Moderate 0 0.016 0.049 Substantial 0.001 0.018 0.064 200 Normal 0.014 0.044 0.071 Moderate 0.013 0.04 0.080 Substantial 0.013 0.029 0.068 500 Normal 0.038 0.051 0.06 Moderate 0.036 0.053 0.071 Substantial 0.036 0.047 0.068 1000 Normal 0.036 0.044 0.043 Moderate 0.039 0.047 0.054 Substantial 0.045 0.057 0.068 Average Type I error rates across conditions 0.018 0.031 0.060 Not e: Estimated Type I error rates with are unacceptable. 76 Table 4 order solution the asymmetric distribution, and bias corrected bootstrap methods: and Path Path Sample Size Degree of Nonnormality of First Order Solution Asymmetric Distribution Bias Corrected Bootstrap 0.31 0 0.5 100 Normal 0 0.007 0.048 Moderate 0.002 0.005 0.066 Substantial 0.001 0.003 0.065 200 Normal 0.008 0.022 0.061 Moderate 0.005 0.023 0.075 Substantial 0.009 0.017 0.062 500 Normal 0.03 0.042 0.064 Moderate 0.03 0.036 0.055 Substantial 0.024 0.035 0.056 1000 Normal 0.027 0.035 0.041 Moderate 0.041 0.042 0.06 Substantia l 0.039 0.045 0.062 0.8 100 Normal 0.013 0.043 0.062 Moderate 0.016 0.035 0.085 Substantial 0.01 0.025 0.076 200 Normal 0.036 0.047 0.06 Moderate 0.03 0.047 0.071 Substantial 0.031 0.04 0.075 500 Normal 0.05 0.053 0.059 Moderate 0.041 0.048 0.051 Substantial 0.042 0.046 0.058 1000 Normal 0.044 0.046 0.046 Moderate 0.048 0.05 0.049 Substantial 0.04 0.043 0.051 Average Type I error rates across conditions 0.026 0.035 0.060 Note: Estimated Type I error rates with are unacceptable. 77 Table 4 order solution, the distribution, and bias corrected bootstrap methods: and Path Path Sample Size Degree of Nonnormality of First Order Solution Asymmetric Distribution Bias Corrected Bootstrap 0.52 0 0.5 100 Normal 0.002 0.007 0.049 Moderate 0.002 0.003 0.063 Substantial 0.002 0.004 0.076 200 Normal 0.01 0.015 0.041 Moderate 0.015 0.021 0.071 Substantial 0.014 0.015 0.071 500 Normal 0.022 0.029 0.04 Moderate 0.04 0.042 0.05 Substantial 0.046 0.05 0.083 1000 Normal 0.049 0.052 0.055 Moderate 0.042 0.044 0.048 Substantial 0.037 0.038 0.051 0. 8 100 Normal 0.032 0.042 0.063 Moderate 0.028 0.037 0.08 Substantial 0.024 0.027 0.082 200 Normal 0.046 0.052 0.059 Moderate 0.036 0.038 0.057 Substantial 0.039 0.046 0.066 500 Normal 0.036 0.041 0.041 Moderate 0.046 0.0 48 0.057 Substantial 0.047 0.048 0.055 1000 Normal 0.062 0.066 0.062 Moderate 0.048 0.051 0.057 Substantial 0.041 0.041 0.047 Average Type I error rates across conditions 0.032 0.036 0.059 Note: Estimated Type I error rates with are unacceptable. 78 Table 4 14. Estimated Type I error rates for Sob order solution, the asymmetric distribution, and bias corrected bootstrap methods: and Path Path Sample Size Degree of Nonnormality of First Order Solution Asymmetric Distribution Bias Corrected Bootstrap 0 0.16 0.5 100 Normal 0 0 0.004 Moderate 0 0.001 0.009 Substantial 0 0 0.014 200 Normal 0.001 0.004 0.013 Moderate 0 0.003 0.008 Substan tial 0 0.005 0.015 500 Normal 0.002 0.008 0.019 Moderate 0 0.003 0.012 Substantial 0 0.005 0.017 1000 Normal 0.006 0.019 0.032 Moderate 0.003 0.021 0.032 Substantial 0.001 0.021 0.03 0.8 100 Normal 0.001 0. 002 0.011 Moderate 0 0.01 0.026 Substantial 0 0.001 0.016 200 Normal 0.005 0.012 0.024 Moderate 0.002 0.016 0.038 Substantial 0.003 0.011 0.031 500 Normal 0.01 0.034 0.044 Moderate 0.013 0.041 0.052 Sub stantial 0.008 0.029 0.046 1000 Normal 0.019 0.044 0.048 Moderate 0.018 0.051 0.066 Substantial 0.027 0.056 0.059 Average Type I error rates across conditions 0.005 0.017 0.028 Note: Estimated Type I error rates with are unacceptable. 79 Table 4 15. order solution, the asymmetric distribution, and bias corrected bootstrap methods: and Path Path Sample Size Degree of Nonnormality of First Ord er Solution Asymmetric Distribution Bias Corrected Bootstrap 0 0.35 0.5 100 Normal 0 0.002 0.018 Moderate 0 0.002 0.019 Substantial 0.001 0.003 0.027 200 Normal 0 0.004 0.016 Moderate 0.001 0.011 0.045 Substantial 0.0 02 0.009 0.038 500 Normal 0.016 0.034 0.059 Moderate 0.013 0.039 0.059 Substantial 0.004 0.028 0.048 1000 Normal 0.026 0.05 0.061 Moderate 0.02 0.045 0.055 Substantial 0.031 0.049 0.067 0.8 100 Normal 0.004 0.023 0.05 3 Moderate 0.008 0.026 0.053 Substantial 0.003 0.024 0.056 200 Normal 0.016 0.038 0.055 Moderate 0.027 0.052 0.073 Substantial 0.025 0.049 0.071 500 Normal 0.038 0.055 0.061 Moderate 0.035 0.051 0.06 Substantial 0. 043 0.053 0.063 1000 Normal 0.048 0.053 0.056 Moderate 0.047 0.054 0.052 Substantial 0.043 0.051 0.048 Average Type I error rates across conditions 0.019 0.034 0.051 Note: Estimated Type I error rates with are unacceptable. 80 T able 4 order solution, the asymmetric distribution, and bias corrected bootstrap methods: and Path Path Sample Size Degree of Nonnormality of First Order Solution A symmetric Distribution Bias Corrected Bootstrap 0 0.49 0.5 100 Normal 0 0 0.025 Moderate 0 0.003 0.039 Substantial 0 0.003 0.045 200 Normal 0.003 0.022 0.051 Moderate 0.005 0.021 0.055 Substantial 0.003 0.011 0.043 500 Normal 0.032 0.069 0.059 Moderate 0.016 0.046 0.062 Substantial 0.021 0.04 0.058 1000 Normal 0.038 0.05 0.058 Moderate 0.027 0.038 0.04 Substantial 0.038 0.047 0.054 0.8 100 Normal 0.013 0.035 0.057 Moderate 0.017 0 .038 0.064 Substantial 0.014 0.039 0.065 200 Normal 0.029 0.046 0.062 Moderate 0.042 0.061 0.075 Substantial 0.02 0.04 0.061 500 Normal 0.05 0.057 0.058 Moderate 0.047 0.058 0.072 Substantial 0.04 0.053 0.054 1000 Nor mal 0.06 0.061 0.062 Moderate 0.043 0.048 0.043 Substantial 0.041 0.047 0.046 Average Type I error rates across conditions 0.025 0.039 0.055 Note: Estimated Type I error rates with are unacceptable. 81 Table 4 17. Estimated Type I er order solution, the asymmetric distribution, and bias corrected bootstrap methods: and Path Path Sample Size Degree of Nonnormality of First Order Solution Asymmetric Distribution Bias Corr ected Bootstrap 0 0 0.5 100 Normal 0 0 0.007 Moderate 0 0 0.01 Substantial 0 0 0.007 200 Normal 0 0 0.005 Moderate 0 0 0.004 Substantial 0 0 0.008 500 Normal 0 0 0.001 Moderate 0 0 0.004 Substa ntial 0 0.001 0.003 1000 Normal 0 0.002 0.003 Moderate 0 0.002 0.003 Substantial 0 0.001 0.004 0.8 100 Normal 0 0.001 0.005 Moderate 0 0.001 0.009 Substantial 0 0 0.01 200 Normal 0 0.001 0.004 Mod erate 0 0 0.003 Substantial 0 0 0.004 500 Normal 0 0.002 0.004 Moderate 0 0.001 0.003 Substantial 0 0 0.002 1000 Normal 0 0 0.001 Moderate 0 0.001 0.001 Substantial 0 0.004 0.003 Average Type I err or rates across conditions 0 0.000 0.005 Note: Estimated Type I error rates with are unacceptable. 95 CHAPTER 5 DISCUSSION AND CONCL USION This Mont e Carlo simulation study investigated the effect of nonnormality in a longitudinal mediation framework using a parallel process latent growth model. The research was undertaken because previous research has not investigated the effect of nonnormality in lo ngitudinal mediation analysis. Interestingly, it was found that among different design factors (i.e., effect size of the mediated effect, sample size, and degree of nonnormality), the degree of nonnormality (i.e., normality, moderate and substantia l nonnormalit y ) did not cause more bias in estimating and testing the mediated effect, whereas, the accuracy of estimates of the mediated effect and statistical power increased as other design factors of the effect size of the mediated effect, sample size, and increased. Accuracy of Estimates for the Mediated Effects and Standard Errors The accuracy of estimates were evaluated with various combinations of paths and First, when there was the mediated effect, (i.e., both population paths and were not zero), the accuracy of the estimated mediated effect improved as the mediated effect size, sample size, and value increased. These results were similar to those in onnormality did not seriously affect the accuracy of the mediated effect estimates. Previous studies in mediation analysis (e.g., Cheong, 2011; MacKinnon et al., 2004; Pituch & Stapleton, 2008) did not assess the accuracy of the mediated effect when the p opulation mediated effect was zero. Interestingly, this study found that all the relative biases for the mediated effect estimates were acceptable when the population mediated effect was zero. 97 mean relative biases were provi ded. Interestingly, when both paths (i.e., ) were zero, outliers of the standard error estimates were more frequently found than when both paths were not zero or when one of paths was zero. Empirical Type I Error Rates o rder solution, the asymmetric distribution method, and the bias corrected bootstrap) produced different estimated Type I error rates across conditions. Based on the estimated Type I error rates, it is difficult to find the effects of the design factors bec ause the estimated Type I error rates were not consistent across order solution and the asymmetric distribution method, the sample size and affected the estimated Type I error rates when only one path ( or ) was zero. Also, the bias corrected bootstrap worked best when only one path was zero. order solution and the asymmetric distribution method produced estimated Type I error rates that increased as the sample size and increased, however, the estimated Type I error rates were not greater than the upper limit of the criterion interval (i.e. 0.075) in all conditions. Based on OLS regression models, MacKinnon et al. (2004) found that estimated Type I error rates by order solution and the asymmetric distribution method tended to increase as the sample size increased (i.e., 50, 100, 200, 500, and 1,000). When both paths were zero, all three methods resulted in very low Type I error rates across all c onditions. This result is consistent with prior studies (Mackinnon et al., 2004; Pituch et al., 2006; Pituch & Stapleton, 2008). 103 Pituch and Stapleton (2008) found that the bias corrected bootstrap produced the highest power, followed by the the asymmetric distributio n method, which was confirmed in this study. As previous studies (Bollen & Stine, 1990; MacKinnon et al., 2004; Pituch & Stapleton, 2008; Shrout & Bolger, 2002) have suggested using the bootstrap methods in testing the mediated effect, the results of the s tudy also recommend the bias corrected bootstrap. Conclusions The purpose of this study was to assess the effects of nonnormality on estimating and testing the mediated effect using a parallel process latent growth model through Monte Carlo simulations. Th e design factors of the study were the degree of nonnormality (i.e., normality, moderate and substantial nonnormality), effect size of the mediated effect (i.e., zero, small, medium, and large), sample size (i.e., 100, 200, 300, and 400), and the va lue (i.e., 0.5 and 0.8). The dependent variables were the relative bias of the mediated effect and standard error estimates, empirical Type I and power rates. It was found that nonnormality had little effect on the accuracy of the estimates of the mediate d effect, empirical Type I error, and power rates although the bias of standard error estimates increased in a few conditions of nonnormality. Furthermore, outliers of the mediated effect and standard error estimates were found with relatively small sample sizes (100 and 200). Interestingly, when both paths ( and ) were zero, the standard error estimates were more frequently and inconsistently biased than when only one path was zero with more outlying estimates, which could cause an incorrect Type I err or rate. 105 and Preacher (2009) su mmarized different longitudinal mediation models in a structural lagged panel parallel process latent gro wth curve model, and thus we can study other longitudinal mediation models. The results of the previous studies (e.g., Cheong, 2011; MacKinnon et al., 2004; MacKinnon et al., 2006; Pituch & Stapleton, 2008; Tofighi & MacKinnon, 2011) suggested that the as ymmetric distribution and the bias corrected bootstrap methods order solution which is the most popular method (MacKinnon et al, 2002), the asymmetric distribution, and the bias corrected bootstrap methods were compared in this study. The results showed that the bias corrected bootstrap method performed best in terms of controlling empirical Type I error and power rates. However, the bias corrected bootstrap method produced very low Type I error rate when both paths and were zero and therefore, we still need to find or develop a method which can produced more accurate Type I error rates estimates related to the med iated effect estimates when both paths and are zero and when one of path is zero and the sample size is relatively small (100 and 200). 10 6 Figure 5 1. Relationship between the estimated media error when and under normality A) Estimated Type I error rate = 0 and sample size = 100. B) Estimated Type I error rate = 0 and sample size = 200. C) Estimated Type I error rate = 0 and sample size = 500. D) Estimated Type I error rate = 0 and sample size = 1,0 00. 107 Figure 5 error when and under normality A) Estimated Type I error rate = 0.004 and sample size = 100. B) Estimated Type I error rate = 0.016 and sample size = 200. C) Estimated Type I error rate = 0.038 and sample size = 500. D) Estimated Type I error rate = 0.048 and sample size = 1,000. 108 LIST OF REFERENCES Arbuckle, J. L. (1995 2010). Chicago, IL: SPSS. Aroian, L. A. (19 47). The probability function of the product of two normally distributed variables. Annals of Mathematical Statistics, 18, 265 271. Baron, R. M., & Kenny, D. A. (1986). The moderator mediator variable distinction in social psychology research: Conceptual, strategic, and statistical considerations. Journal of Personality and Social Psychology, 51, 1173 1182. Bauer, D. J., & Curran, P. J. (2003). Distributional assumptions of growth mixture models: Implications for overextraction of latent trajectory classes. Psychological Methods, 8, 338 363. Bauer, J. D., Preacher, K. J., & Gil, K. M. (2006). Conceptualizing and testing random indirect effects and moderated mediation in multilevel models: New procedures and recommendations. Psychological Methods, 11, 142 163 Bobko, P., & Rieck, A. (1980). Large sample estimators for standard errors of functions of correlation coefficients. Applied Psychological Measurement, 4, 385 398. Bollen, K. A., & Curran, P. J. (2004). Autoregressive latent trajectory (ALT) models for s ynthesis of two traditions. Sociological Methods & Research, 32, 336 383. Bollen, K. A., & Curran, P. J. (2006). Latent curve models: A structural equation perspective Hoboken NJ: John Wiley & Sons, Inc. Bradley, J.V. (1978). Robustness? The British Journ al of Mathematical & Statistical Psychology, 31, 144 152. Carpenter, J., & Bithell, J. (2000). Bootstrap confidence intervals: when, which, what? A practical guide for medical statisticians. Statistics in Medicine, 19, 1141 1164. Cheong, J., MacKinnon, D. P., & Khoo, S. T. (2003). Investigation of mediational process using parallel process latent growth curve modeling. Structural Equation Modeling, 10, 238 262. Cheong, J. (2011). Accuracy of estimates and statistical power for testing mediation in latent gr owth curve modeling, Structural Equation Modeling, 18, 195 211. Cheung, G. W., & Lau, R. S. (2007). Testing mediation and suppression effects of latent variables: Bootstrapping with structural equation models. Organizational Research Methods, 11, 296 325. Craig, C. C. (1936). On the frequency function of xy Annals of Mathematical Statistics, 7, 1 15. 109 Cole, D. A., & Maxwell, S. E. (2003). Testing meditational models with longitudinal data: Questions and tips in the use of structural equation modeling. Journ al of Abnormal Psychology, 112, 558 577. Collins, L. M., Graham, J. J., & Flaherty, B. P. (1998). An Alternative framework for defining mediation. Multivariate Behavioral Research, 33, 295 312. Finch, J. F., West, S. G., & MacKinnon, D. P. (1997). Effects of sample size and nonnormality on the estimation of mediated effects in latent variable models. Structural Equation Modeling, 4, 87 107. Goodman, L. A. (1960). On the exact variance of products. Journal of the American Statistical Association, 55, 708 71 3. Hoogland, J. J., & Boomsma, A. (1998). Robustness studies in covariance structure modeling: An overview and a meta analysis. Sociological Methods & Research, 26, 329 367. Jagers, R. J., Morgan Lopez, A. A., Howard, T. L., Browne, D. C., Flay, B. R., & A ban Aya Coinvestigators. (2007). Mediators of the development and prevention of violent behavior. Prevention Science, 8, 171 179. Judd, C. M., & Kenny, D. A. (1981). Process analysis: Estimating mediation in evaluation research. Evaluation Research, 5, 602 619. Krull, J. L., & MacKinnon, D. P. (1999). Multilevel mediation modeling in group based intervention studies. Evaluation Review, 23, 418 444. Krull, J. L., & MacKinnon, D. P. (2001). Multilevel modeling of individual and group level mediated effects. M ultivariate Behavioral Research, 36, 249 277. Lecce, S., Caputi, M., & Hughes, C. (2011). Does sensitivity to criticism mediate the relationship between theory of mind and academic achievement? Journal of Experimental Child Psychology, 110, 313 331. Lei, M & Lomax, R. G. (2005). The effect of var ying degrees of nonnormality in structural equation modeling. Structural Equation Modeling, 12, 1 27. Leite, W. L. (2007). A comparison of latent growth models for constructs measured by multiple items. Structural Equation Modeling, 14, 581 610. Leite, W. L., & Stapleton, L. (2011). Detecting growth shape misspecifications in latent growth models: An evaluation of fit indices. The Journal of Experimental Education, 79, 361 389. Li, X. (2011). An evaluation of parame ter estimation when using multilevel structural equation modeling for mediation analysis. Doctoral dissertation, University of Texas, Austin, TX. 110 Liang, T. L., Chan, L. C., Lin, C. W., & Huang, Y. L. (2011). Relationship between leadership behavior and tas k performance: The mediation role of job satisfaction and the moderation role of social distance. African Journal of Business Management, 5, 5920 5928. Littlefield, A. K., Sher, K. J., & Wood, P. K. (2010). Do changes in drinking motives mediate the relati drinking? Journal of Abnormal Psychology, 119, 93 105. MacKinnon, D. P. (2008). Introduction to statistical mediation analysis. New York: Erlbaum. MacKinnon, D. P., & Dwyer, J. H. (1993). Estimati ng mediated effects in prevention studies. Evaluation Review, 17, 144 158. MacKinnon, D. P., Fritz, M. S., Williams, J., & Lockwood, C. M. (2007). Distribution of the product confidence limits for the indirect effect: Program PRODCLIN. Behavior Research Me thods, 39, 384 389. MacKinnon, D. P., Lockwood, C. M., Hoffman, J. M., West, S. G., & Sheets, V. (2002). A comparison of methods to test mediation and other intervening variable effects. Psychological Methods, 7, 83 104. MacKinnon, D. P., Lockwood, C. M., & Williams, J. (2004). Confidence limits for the indirect effect: Distribution of the product and resampling methods, Multiva riate Behavioral Research, 39 99 128. Manly, B. F. (2007). Randomization and Monte Carlo methods in biology. New York: Chapman and Hall. McArdle, J. J. (1988). Dynamic but structural equation modeling of repeated measures data. In J. R. Nesselroade & R. B. Cattell (Eds. ), Handbook of multivariate experimental psychology (2nd ed., pp. 561 614). New York: Plenum. McArdle, J. J., & Ness elroade, J. R. (1994). Using multivariate data to structure developmental change. In S. H. Cohen & H. W. Reese (Eds. ), Life span developmental psychology; Methodological contributions (pp. 223 267). Hillsdale, NJ: Erlbaum. Meeker, W. Q., Cornwell, L. W. an d Aroian, L. A. (1981). Selected tables in mathematical statistics, volume VII: The product of two normally distributed random variables. Providence, RI: America Mathematical Society. the annual meeting of the Psychometric Society, Santa Barbara, CA. Meredith, W., & Tisak, J. (1990). Latent curve analysis. Psychometrika, 55, 107 122. 111 Muthn, B. O. (1997). Latent variable modeling of longitudinal and multivariate data. In A. Raftery (Ed. ), Sociological methodology (pp. 453 480). Boston: Blackwell. Muthn, B., & Asparouhov, T. (2002). Using Mplus Monte Carlo simulations in practice: A note on non normal missing data in latent variable models. Version 2, March 22, 2002. Muthn, B., & Kaplan D. (1985). A comparison of some methodologies for the factor analysis of non normal Likert variables. British Journal of Mathematical and Statistical Psychology. 38, 171 189. Muthn, B. O., & Muthn, L. K. (2010). Mplus (Version 6.0). Los Angeles, CA: Mu thn & Muthn. Muthn, B. O., & Shedden, K. (1999). Finite mixture modeling with mixture outcomes using the EM algorithm. Biometrics, 55, 463 469. Pituch, K. A., Stapleton, L. M., & Kang, J. Y. (2006). A comparison of single sample and bootstrap methods to assess mediation in cluster randomized trials. Multivariate Behavioral Research, 41, 367 400. Pituch, K. A., & Stapleton, L. M. (2008). The performance of methods to test upper level mediation in the presence of nonnormal data. Multivariate Behavioral Res earch, 43, 237 267. Preacher, J. K. (2011). Multilevel SEM strategies for evaluating mediation in three level data. Multivariate Behavioral Research, 46, 691 731. Preacher, K. J., & Hayes, A. F. (2004). SPSS and SAS procedures for estimating indirect effec ts in simple mediation models Behavior Research Methods, Instruments, & Computers, 36, 717 731. Preacher, K. J., Zyphur, M. J., & Zhang, Z. (2010). A general multilevel SEM framework for assessing multilevel mediation. Psychological Methods, 3, 209 233. R ao, C. R. (1958). Some statistical models for comparison of growth curves. Biometrics, 14, 1 17. R Development Core Team. (2010). R: A language and environment for statistical computing. Vienna, Austria: R Foundation for Statistical Computing. Rasbash, J., Steele, F., Browne, W., & Prosser, B. (2005). Bristol, UK: Center for Multilevel Modeling, University of Bristol. Selig, J. P., & Preacher, K. J. (2009). Mediation models for longitudinal data in developmental research. Research i n Human Development, 6, 144 164. 112 Shi, Y. (2009). The impact of unmodeled time series processes in within subject residual structure in conditional latent growth modeling: A Monte Carlo Study. 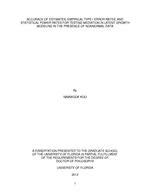 Doctoral dissertation, University of Florida, Gainesville, FL. S hrout, P. E., & Bolger, N. (2002). Mediation in experimental and nonexperimental studies: New procedures and recommendations. Psychological Methods, 7, 422 445. Sobel, M. E. (1982). Asymptotic confidence intervals for indirect effects in structural equatio n models. In S. Leinhardt (Ed. ), Sociological Methodology, (pp. 290 312). Washington, DC: American Sociological Association. Sobel, M. E. (1986). Some new results on indirect effects and their standard errors in covariance structure models. In N. Tuma (Ed. ), Sociological Methodology 1986 (pp. 159 186). Washington, DC: American Sociological Association. Tisak, J., & Tisak, M. S. (1996). Longitudinal models of reliabilit y and validity: A latent curve approach. Applied Psychological Measurement, 20, 275 288. T hoemmes, F., MacKinnon, D. P., & Reiser, M. R. (2010). Power analysis for complex mediational designs using Monte Carlo methods. Structural Equation Modeling, 17, 510 534. Tofighi, D., & MacKinnon, D. P. (2011). RMediation: An R package for mediation analy sis confidence intervals. Behavior Research Method, 43, 629 700. Tucker, L. R. (1958). Determination of parameters of a functional relation by factor analysis. Psychometrika, 23, 19 23. Tucker, L. R. (1966). Learning theory and multivariate experiment: Ill ustration of generalized learning curves. In R. B. Cattell (Ed.). Handbook of multivariate experimental psychology (pp. 476 501). Chicago: Rand McNally. von Soest, T., & Hagtvet, K. A. (2011). Mediation analysis in a latent growth curve modeling framework. Structural Equation Modeling, 18, 289 314. von Soest, T., & Wichstrm, L. (2009). Gender difference in the development of dieting from adolescence to early adulthood: A longitudinal study. Journal of Research on Adolescence, 19, 509 529. Wong, W. S., Chan S. T. M., Fung, V. B. K., & Fielding, R. (2010). The differential mediating effects of pain and depression on the physical and mental dimension of quality of life in Hong Kong Chinese adults. Health and Quality of Life Outcomes, 8, 1 6. Zhao, X., Lynch, J. G., & Chen, Q. (2009). Reconsidering Baron and Kenny: Myths and truths about mediation analysis. Journal of Consumer Research, 37, 197 206. 113 BIOGRAPHICAL SKETCH Namwook Koo was born in Seoul, South Korea. He graduated from Sungkyunkwan University South Korea with a in education and a in educational measurement in 2004 and 2006 respectively. He received his doctorate from the University of Florida with a major in research and evaluation methodology in August 2012.